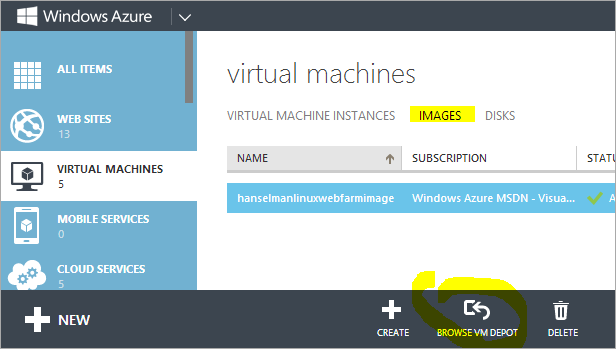 When you want to make a new Virtual Machine from the Azure Portal, from the menu you "Create New | Virtual Machine" and you'll see the default images alongside images you have uploaded or created yourself. There's a pile of Windows stuff, and if you scroll down, some good Linux images like openSUSE, CentOS and Ubuntu. Note: There's also a Visual Studio Ultimate 2013 Preview, so remember, you can sign up for a free Azure trial and remote into Visual Studio in the cloud and mess around if you like. If you have MSDN you have credits already, so associate your MSDN with Azure. 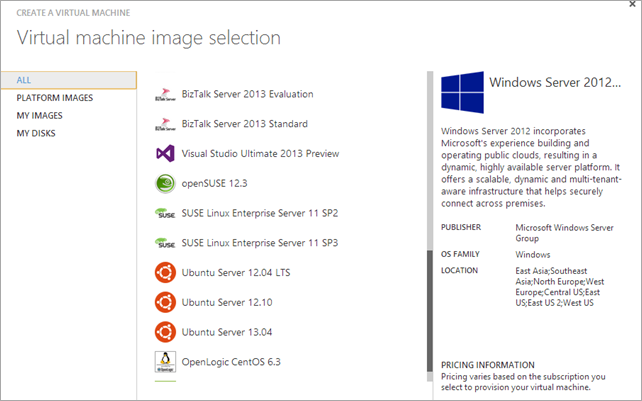 It's nice to have Linux on Azure, but this isn't the richest selection of images. There SHOULD be a new section here, in my opinion. Ah, but if you go to the Virtual Machines area, then click Images, there is a link to Browse VM Depot. One of the great secrets of Azure. I'm working with them to get this more obvious, because it really is epic. And then…bam. Now we're talking. There’s actually over 400 open source VM images in there, made by the community and companies like BitNami, and hosted by MS Open Tech. You can create VMs from this interface within the Azure Portal, but I think it's even easier to make VMs from the command line. Then get your account certificates and import it. Then, select a subscription. This is all a one-time thing. azure account set "some other account name"
Let's say I want a Redis image. I can visit http://vmdepot.msopentech.com and find a Redis one. Here's a customized Ubuntu 12.04 image with Redis configured and hardened security. That vmdepot number there is the image identifier that tells Azure to copy that VM image over from the VM depot and make a new instance. Make sure you add --ssh or you won't be able to get in at all! At this point Azure has made the VM from this image. You can than open up endpoints and port forward to the outside world so you can access your service, or create virtual internal networks to keep this VM private. Remember, these are community driven so YOU can publish images of your open source stack if you want. As with all galleries of community-grown stuff there will be some gems and some duds. I like the Bitnami stuff, for example, as they appear to know what they are doing. Regardless, use good sense and explore and evaluate before you bet your startup on an image. Still, these are a great way to get a VM running in minutes, not hours or days. Sponsor: Big thanks to Red Gate for sponsoring the feed this week. Be sure to pick up their Free eBook: 25 Secrets for Faster ASP.NET Applications - Red Gate has gathered some great tips from the ASP.NET community to help you get maximum performance from your applications. Download them free. Out of curiosity, how safe are all these free images? What garantee do we have that they don't contain any form of spyware, malware, or other types of <not_in_my_yard>ware? Martin - It's always possible, but the VM Depot time will perform takedowns as complaints come in. It's the same with really any package gallery. There's always a chance. VM depot is great but another UI adjustment I would like to see is grouping the VM's having discourse 0.9.0-1, discourse 0.9.1-0, discourse 0.9.2.5-0.... on the vm list seems a little odd to me. I think it would be better if you select discourse and then the version after. Course it may be more complex if the VM runs more than one core piece of software. Pete - I agree. It makes it hard to see what the newest is. Hummm...very nice to know. How about integrating the vm's offered on the modern.ie site into this list so I can spin up multiple versions of IE just for testing? Thanks! I was just about to create a Discourse VM. You just saved me some time. Is there a guide for how to create images and get them into the gallery? Tom - here is the info on how to create VHD images and publish them to VM Depot. Let me know if you need more info, and one of our team members will guide you through the process. Actually it is even more awesome than what you describe. 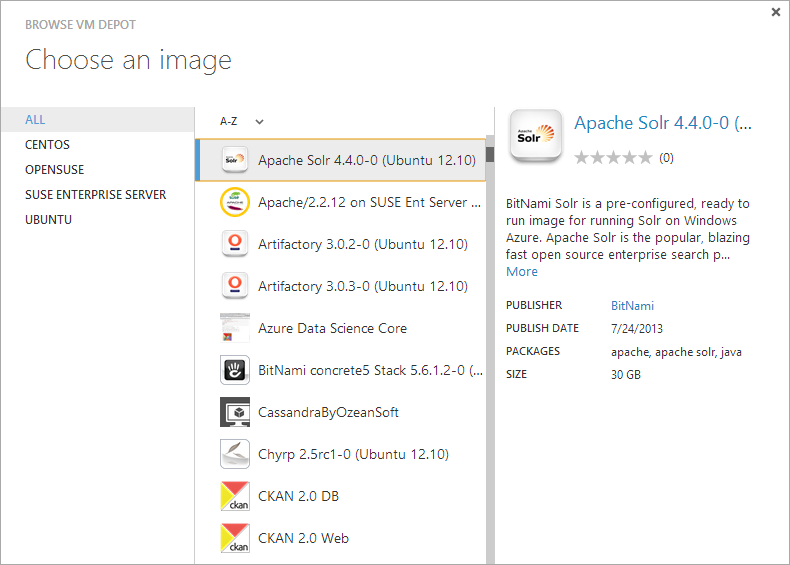 It seems that BitNami is providing most of their images for Azure. For those that don't know BitNami has been around for quite a while and has packages for almost every open stack you can imagine. You can download and use them locally as well. 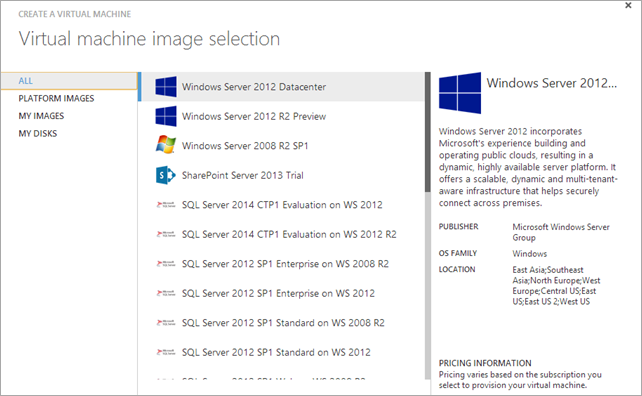 This makes Azure even more usable to many.I know it makes me happy ! According to Edward Snowdon, the NSA have direct access to Microsoft's user data. Does this include the Azure platform? Will my company's data be safe from the snooping eyes of the NSA if I host it here? Yes, don't worry we will not look into your stuff. While addressing the findability of the Depot you might point out how overly visible the static banner is. Fully 1/2 my screen is devoted to static chrome - ick. So you could put up a Raspberry Pi emulation image for doing server based on demand compiles. Next step is to make it easy to create Azure VM's with XP/Vista/Win7/Win8 - 90 day trial or whatever - for testing purposes. Don't make everyone jump through the same hoops! 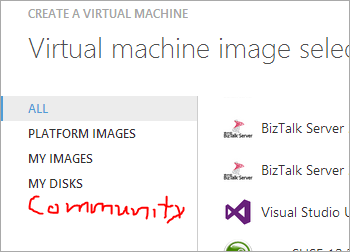 How do you manage sharing virtual machine images in Azure and Since open source images are also uploaded by the community. How do you prevent an attacker from examining virtual machine image templates?